Cats love to have cozy places to sleep. If you’ve recently added a cat to your family or are looking to buy your current furbaby a bed, we’ve got you covered! Our cat bed buying guide will help you choose a bed that’s perfect for your furry feline companion, regardless of how old or large they are. There’s a bed on this list for every cat! But before we get started, here are some parameters you should keep an eye on. Material: What is the cat bed made of? Some are made with more pliable materials, such as wool, where there are some made of wood. Most are commonly made of cotton, or sometimes oxford cloth to keep them soft. Enclosed: Enclosed cat beds have walls that come together at the top of the bed, making a little cave for your pets. Cats especially love enclosed spaces, as it makes them feel safe – perfect for nervous felines! Machine Washable: Some of the beds on the list can be tossed into the washing machine when it’s time to clean them. Others, however, may be hand-wash only. You’ll have to keep an eye on the instructions to be sure. Weight Range: People with bigger cats might be concerned that the bed won’t be big enough, or else won’t support the weight of the cat. That’s why we added a weight range – so you know how big your cat can be. Size: The dimensions of the bed can also tell you how big your cat can be to still fit comfortably in the bed. It can also tell you where in the home the bed will best fit. Warranty: A warranty works in your favor in case there are manufacturing errors with the cat bed. Within this time, if it malfunctions in some way, you can get a replacement. Some offer refunds if your cat doesn’t like it. Now that you know what you’re looking at when it comes to cat beds, you can check out our cat bed reviews! We’ve searched high and low to bring you cozy sleeping places that your pets will enjoy. They’re part of your family, so we want to help them be comfortable as well. Check out our top pick and budget pick first – they’re the best we found during our research! The others on our list are cozy too! Our pick for the best cat bed ever is this handmade bed from Meowfia. It’s made of one hundred percent Merino Wool. It’s soft and pliable, and cats love the smell of wool that comes off of it. If you aren’t a fan, expose it to fresh air for a while until the smell goes away. But there’s plenty of room inside for all of your favorite furry companions to rest, from brand new kittens to 20-pound cats. It’s a great play cave as well as a bed, as well! We love that it’s eco-friendly, so it’s not made with any synthetic products or harsh chemicals, so it’s safe for both the environment and your feline! The wool it is made of works to naturally repel dirt and odor, so it’s easy to wipe down and wash! It’s warm and cozy, just like your cat deserves. You can even use it for small dogs if you have them! One of the best cheap cat beds on our list is this product from Petmate. It’s the standard cat bed that you might think of when you first imagine a cat bed. 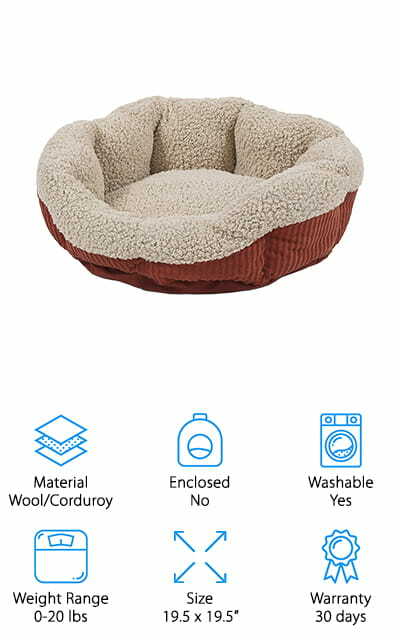 It’s made of corduroy on the outside but lined on the inside with faux wool so that your pet feels comfortable and secure. The bottom is coated with a non-skid material so that you don’t have to worry about the bed’s stability. But the most awesome thing about this bed is the middle layer. Instead of just being fluffy, there is an inner layer of Mylar-type material that is made to reflect heat. This is the same material made in “space blankets”, and it returns your pet’s body heat. It’s a heated cat bed that doesn’t use any electricity! We love that it runs entirely on your cat’s own heat. That makes it nice and cozy for them, and will give you peace of mind as well! This Best Friends bed by Sheri is a great, deep cat bed that will make your pet feel like they’re being snuggled tight! It’s a great orthopedic bed as well, which makes this one of the best cat beds for older cats. 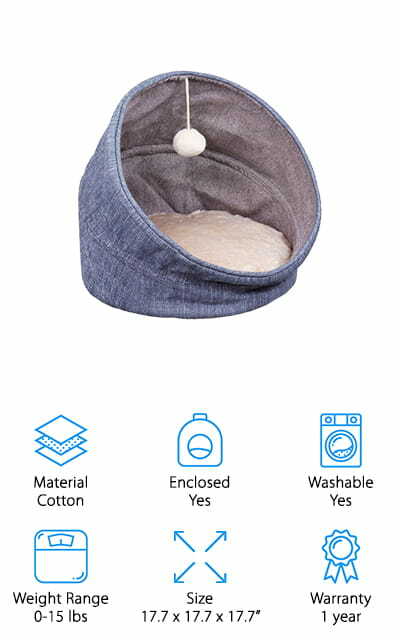 It’s stuffed with AirLOFT fibers, which are a higher quality alternative to the stuffing of some of the other cat beds on the market. It is reputed to hold its shape and comfort level for up to three times as long! That’s great for your pet. The deep sides of this bed help to provide a sense of security and help your pet to return a lot more of their natural warmth than a bed that has smaller sides. It’s a luxury bed with plenty of room for your cat of any size! If you have a dog, they might fight over it! Up to 20 pounds, this bed will provide optimum comfort and security. Some might argue that the Armarkat Cave is the best cat bed on our list. It’s certainly a contender! It’s super soft and plush and will conform to your cat’s shape and body to help them feel comfortable and secure. The bed is made of a soft velvet material in tan and ivory, a beautiful color combination. Your cats won’t be able to get enough of this bed! The filling is an extra thick polyfill, so it’s not only soft but it’s plush and comfortable as well! The bottom is a non-skid base that will save your pets and your floors, and if it gets dirty, you can easily throw it into the washing machine with all of your other laundry. Your pet will feel safe in this cave-like bed that is meant to give them privacy and security as well as comfort. It will fit most regular sized cats, from kittens to adults. This Snooze Tunnel by Pet Palace is one of the best cat beds for kittens because it’s meant for cats smaller than 15 pounds. What makes this bed one of the best is the versatility in its design. 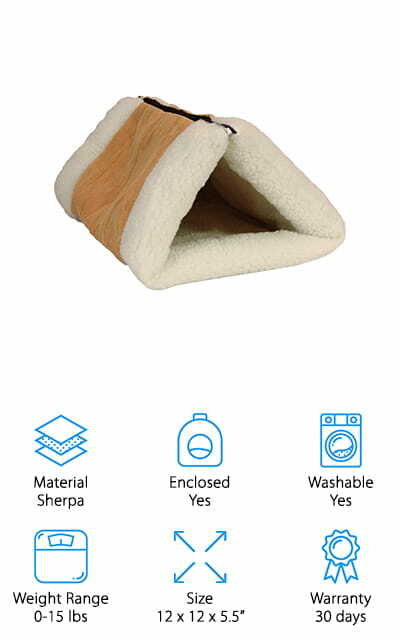 It’s covered in soft Sherpa with extremely plush poly filling that will make your felines feel comfy and safe. However, instead of just being a flatbed or an enclosed bed, you can choose to make it into either one. As a flat bed, it’s large enough to hold several kittens or an adult cat. Zipped closed, it provides that same adult cat with tons of comfort and security. 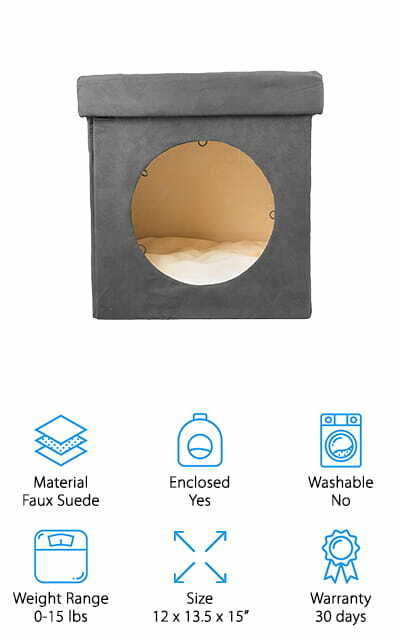 The core is made of a Thermo-Reflective material that will reflect and retain your cats’ body heat, so you can use this bed as an extra cushion for an existing cat bed to add a warming feature. Soft and warm, this bed is everything a cat wants and more. 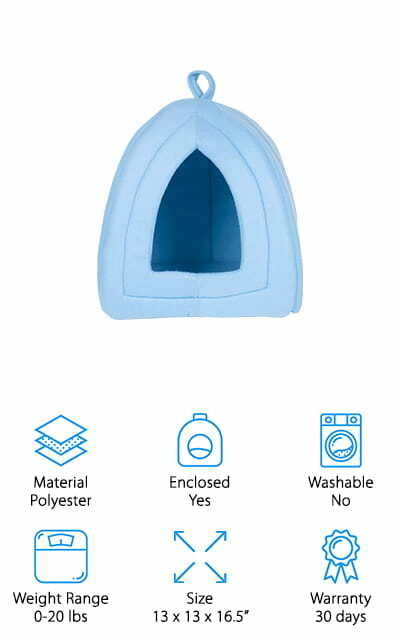 This Igloo Cat Bed from PETMAKER is one of the best cat beds for sale! It’s completely enclosed to keep your pets happy and feeling secure. Since cats naturally enjoy small spaces they can squeeze into, this is the perfect bed for a shy cat or one who doesn’t like many other beds that you’ve tried. The pillow on the bottom is an insert that can be easily removed and cleaned so that you don’t have to stress about it being dirty. The high walls and tight space will become home to even the shiest of kitties. 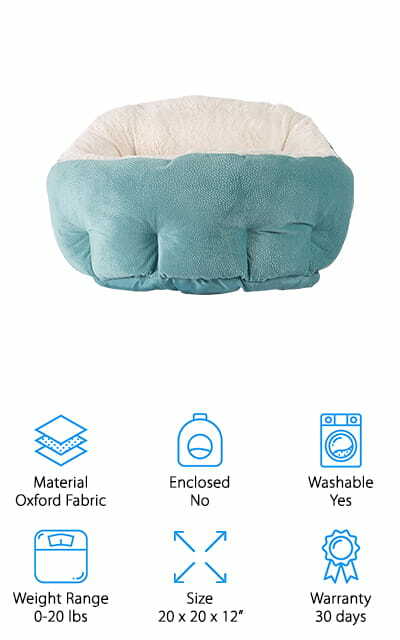 This bed should only be washed by hand, due to the fact that it’s made of polyester and polyurethane foam for the stuffing. We love all the options that this bed comes in: it comes in blue, orange, grey, pink, and tan – so whichever you or your cat likes best, it’s available! This will help it fit flawlessly in with your décor. This Easyology Cube Bed has one of the best cat beds design that we found during our research. 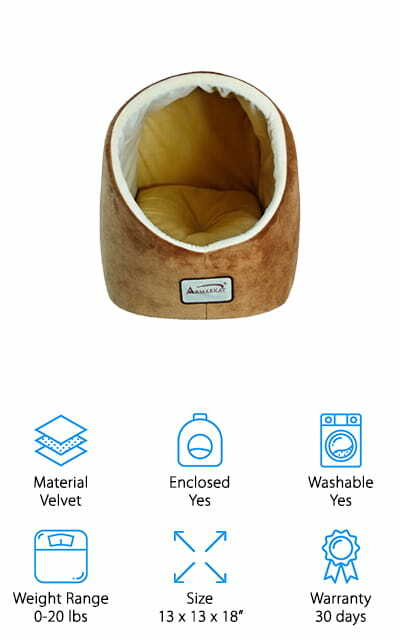 This is due to the fact that it’s a great bed on its own, but it can also be connected to other beds via soft suede tunnels that you can buy separately. The bed itself is a cube-shaped hideaway that’s big enough for your favorite feline friend to curl up in, or stretch out if they’re small enough. It can even serve as a cozy home for a whole litter of kittens! The cushion that comes with it is thick and soft and can be removed for easy cleaning. Your pets will be super comfortable. It’s all washable by hand, and each of the beds has handles for easy movement. It’s a great cat bed for people who have multiple cats because you can connect them! Now your pets can nap and play together in their own bed system! This Shark Pet House is simply adorable! 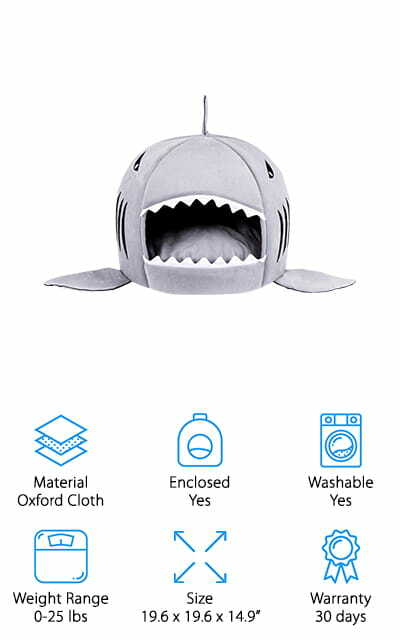 It’s a soft-sided, comfortable pet house that makes it look like your cat or small dog is resting inside the mouth of an adorably irresistible shark. For cats up to twenty-five pounds, this is a comfortable haven with just enough room to curl up and take an afternoon nap. You can remove the cushion inside, and that part is machine washable so you can keep it clean. The bottom of the bed is anti-slip, so it stays in place easier – your cat’s movement inside won’t make it roll or slump. The comfortable filling makes sure to return all of your pet’s body heat, so they stay nice and cozy. It’s so effective at doing it that we think it’s a perfect substitute for some of the best heated cat beds. Your feline is sure to love this cozy, comfortable bed that’s big enough for even your largest cat! This bed by Necoichi is understated and cute as a button! It’s made of an exterior of birch wood, with sturdy, wrapped cardboard for the floor and interior walls. It looks as simple as one of the designer cat beds you might expect to see in high-end pet stores. But that’s because it’s modeled to be both a bed and a scratching post. Does your cat like sleeping in the box the bed came in, rather than the bed? That’s no longer an issue! Cats love sleeping in box-shaped things, and this is no different. It even feels the same and has the added bonus of saving your furniture from their claws as well. Did we mention that from above, the bed is shaped like the head of a cat? Because it is, and that’s pretty amazing! As an added bonus, the glue that keeps it together is made from cornstarch, so your cat can chew away! The last bed on our list is one of the best cat beds for large cats on our list. Its large size makes it spacious and comfortable, even for your laziest housecats. It’s a tunnel bed, which can go from being completely enclosed to being just a round bed by using a collapsible wall system. 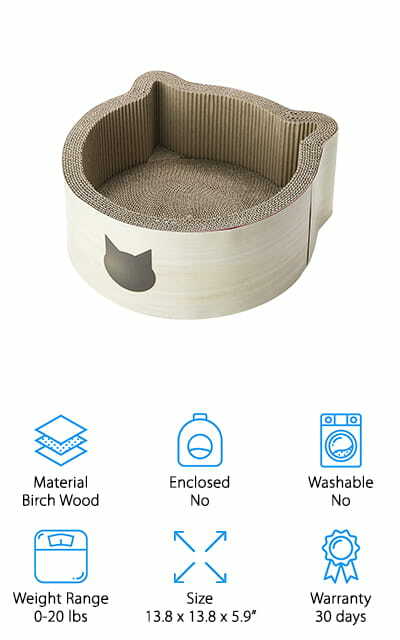 The barrel design is unique but also useful, as it allows your cat to have both types of beds in one product. 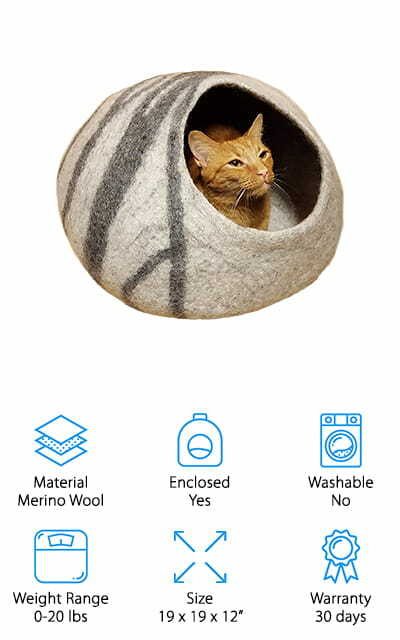 The filling is extra thick cotton, so your cat is also sure to be extremely comfortable. It’s flexible and the soft cushions will help your aging cats’ joints feel much better. There is even a plush ball on the top of the bed that your cat can play with in its new fancy bed. We love the removable cushion so you can wash it, as well as the non-slip bottom of the bed that keeps it in place!